This is a full show, with a progression from the tiniest bubbles up to enormous bubbles, with music and lighting to add to the mood. 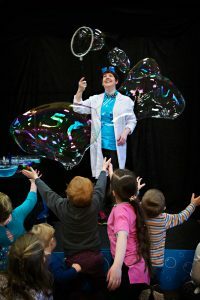 Watch as Steff creates bubbles of all shapes and sizes, with bubbles inside bubbles, smoke filled bubbles, magical bubbles and even kids inside bubbles! The show is very interactive and is suitable for all ages. Steff brings along everything she needs, including waterproof flooring etc to protect the venue. Perfect for fetes, festivals, carnivals, weddings, schools, garden parties etc, Steff’s outdoor bubbles are spectacular. If the wind is calm, it is possible to create enormous bubbles the size of cars!! On windier days, our “bubble bunting” comes into its own, which can fill a large field with bubbles in seconds.